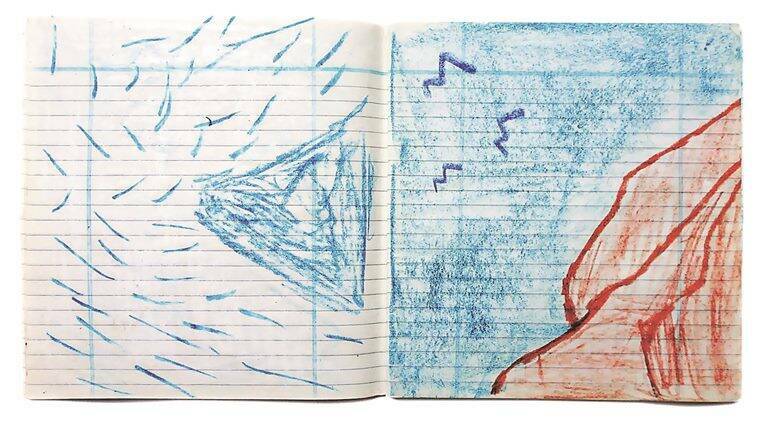 A notebook with an unknown little girl’s sketches took photographer Chandan Gomes on a journey through the hills of Himachal Pradesh, Uttarakhand and Ladakh. He wished to return with photographs made for her, inspired by her. Does he ever find her? Among the several kinds of visual storytelling is the poetic — one that deftly portrays a story in its truth, fiction or somewhere in the gap between the two. Photography has transitioned from several genres (such as photojournalism, documentary, fashion etc.) into a form that invites a dynamic engagement with text and other media. The photobook is no exception. Chandan Gomes, 28, has recently authored a moving book of photographs, words and drawings (latter by A.H. Bano) titled This World of Dew (Photoink). “I grew up in a modest neighbourhood in Delhi and photography for me is a medium to reflect on my emotional and intellectual concerns,” says Gomes. He studied philosophy at St. Stephen’s College in New Delhi and also received the India Habitat Centre fellowship for photography in 2011. This was followed by the Oslo University scholarship to participate in Chobi Mela (Bangladesh) in 2012, the Neel Dongre award in photography in 2013 and the Foto Visura Spotlight grant in 2014. This World of Dew was released recently by photographic artist Roger Ballen. Where did you find AH Bano’s sketchbook? In 2011, while commissioned to photograph a hospital in Jaipur, I visited a hospice called Avedna Ashram. I found a book with drawings of mountains on a shelf there. Suspecting that it might’ve belonged to a child perhaps housed in or visiting the hospice, I tried to trace the owner for a couple of months but it was in vain. The book had no name and I decided to keep it. The drawings in the book are by a little girl and yet they are not entirely childlike. The skies are all but simple, the mountains take on different colours and are placed oddly. Were you keen to explore this aesthetic? Yes, the sketches were unusual, sometimes uncanny. I’d decided to travel with the book to the hills in order to photograph the landscapes, but I never wanted my photographs to overshadow Bano’s sketches. Did you always have a book in mind for this journey? At first, I only wanted to travel, return with my photographs and give all of it to the child when I found her. I never thought of this as a book project or even a photo essay. I often thought about how the child was clueless about my engagement with the book and that perhaps imitating the drawings would be a good way to start understanding her sketched landscape and bring it back to her as a token of appreciation from the world outside. Did her drawings introduce you to a new way of looking at the mountains when you travelled to them? Certainly. I did approach the landscapes in a raw manner, making sure that my photographs did not have an agency of their own. Some of the girl’s drawings were almost impossible to find as real scenes. For me, the drawings were a tryst with her imagination and they forced me to imagine what I would strive to find in my photographs. Each time I returned from the mountains, I discarded the clever images. This book touches on intimacy and loss but it also celebrates a bond between two kinds of visual media and the text. How did you weave these together? I would say that it all started with a little curiosity — but it was frustrating as well. For Bano, the drawings of the mountains were probably a remembrance of the future while for me, the photographs were about remembering the past. I wrote constantly in my diary as I travelled with hers. My entries were indulgent ramblings, the kind that most people scribble when they’re young. But as I made several trips, things started to fall in place. I was travelling inside the mountains as much as along them and I was constantly travelling inside myself. The thread between my photographs, writings and her drawings wasn’t loose anymore. When you found out about Bano’s death, you were heartbroken. Was there a sense of completion (of your journey) or was it an abrupt end? The news of her death did not bring any sense of completion at all. Knowing that she had been very ill and had actually never seen the mountains saddened me deeply. She had died even before I had found the book. I knew that I could never meet her to give her my photographs . The journey felt a little aimless and I dropped the idea of making anything out of it altogether. It lay in my hard drives. It was only in early 2015 that I revisited all the content and started compiling them into a book. I noticed that the first and last images in the book are reproductions of the front and back of Bano’s only photograph. Yes, those are both sides of her only known photograph — and she’d coloured on either side. In many ways, there is a sense of this fable coming full circle. The final published book is intentionally like Bano’s sketchbook. It is pocket-sized, easy to carry and refer to. Her sketches and my photographs lie next to each other like miniatures, drawing the reader in to pay more attention to detail. I worked on the photographs, sometimes using filters to make them appear as close to the drawings. I chose a paper with the feel of handmade paper so that it felt like an artist book. This memoir too lets people make their own assumptions by lending them several entry and exit points into both Bano and my imagined journeys.